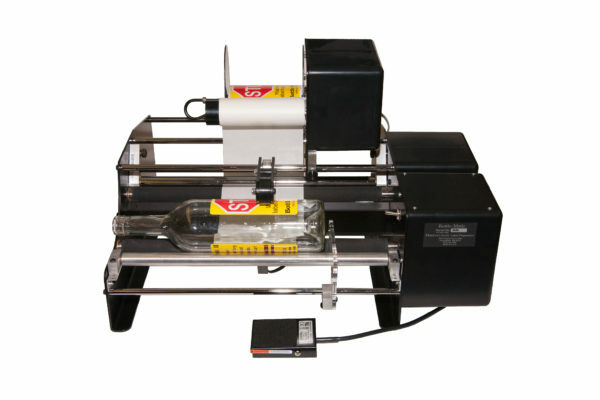 The Bottle-Matic II Label Applicator enables the user to label all kinds of cylindrical objects by simply inserting the container and pressing a foot switch. Once the foot switch is activated the label is applied at over 4.5″ per second, most water bottles are labeled in less than 2 seconds! This allows the user to quickly remove the bottle and insert another to start the procedure again. Once a rhythm is established bottles are labeled VERY quickly. 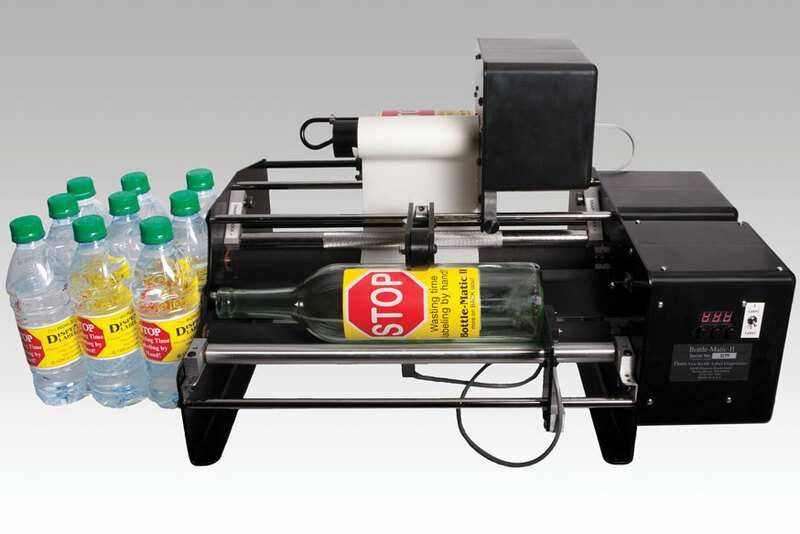 The Bottle-Matic can label products at speeds of 1200 Pieces an hour! Waste-Rewinder– $375 : This option automatically rewinds the waste paper that is produced after labeling your product. Without this attached the waste paper would simple fall over the back of the machine and into a waste bin. 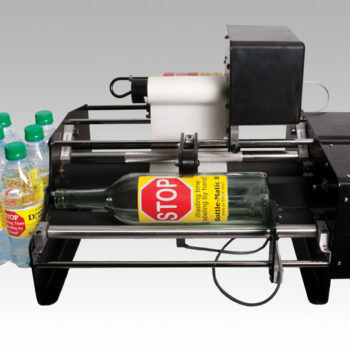 Auto-Matic- $125: This labeling option allows you to just insert your bottle and the labeler automatically activates. Foot switch is still included, but not needed! Label objects from .5″ to 6″ diameter. From a Test Tube to a 1.5 gallon bottle . ACCURATE: Holds 1/64th” side-side accuracy on most containers. Able to handle most tapered containers by simply adjusting the idle roller position. Physical trigger into optical sensor activated, will work on all kinds of labels. Side frames: Laser-Cut from the drawing quality steel then formed, countersunk, de burred, and inspected one at a time at our facility. Dispensing Tables: formed out of 6061-T6 Aluminum. The peel edge is hand milled to spec within .001″ using a special hand-made cutting tool to get that perfect peeling edge needed to dispense labels without tearing the backing paper. Polished with ultra-fine polishing compound so paper flows freely around the plate. Motors: Bottle-Matic uses DUAL AC shaded pole gear motors, made in the USA, to our specifications.